I've never been to Neza, a food cart on Hawthorne and 33rd, before today. 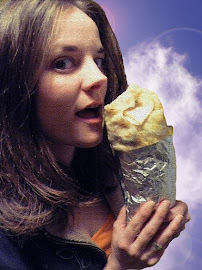 I wanted my first review to be completely unbiased, with no preconceived notions on how this particular burrito should taste. I was delightfully surprised. My quest for the best burrito in Portland has begun! The thinly sliced steak was the perfect texture. Juicy and subtle. A little greasy, but not too much. The first couple of bites in, I feared there might not be enough asada, but in another bite or 2, it was plentiful. The red hot salsa was also bursting with flavor, but the burrito stood well on its own. The fresh cool pico and sour cream brought it all together, making this one well rounded burrito. It wasn't as girthy as some burritos tend to be, but this is because it wasn't packed full of fillers like rice and lettuce, which I wholeheartedly appreciate. It was decently filling, but not food-coma huge. I would add more beans, but that's only because I loooooooove beans. Will I go there again? Yes.